Contours are something that people have repeatedly asked me about – it’s even the closing subject on my radio interview a couple of weeks ago. This weekend I finally knuckled down and got to the bottom of a few outstanding problems (with thanks, as ever to Dave), and from today the cycle map takes a great leap forwards with world-wide contour coverage – well, “world-wide” as in everywhere that’s rendered on the cycle map. Volcano spotting in the Philippines! I’m really pleased with the way they’ve turned out, and I think this marks a step-change in functionality for cyclists planning their rides (or consoling themselves afterwards!). It does, however, take quite a lot of processing to generate these – it’s not for the faint-hearted or anyone without a quad-core machine overflowing with RAM and hard-disk space! The eagle-eyed amongst you may notice that all the roads have been tweaked and are more colourful now, but it’s still a cycling-focused map. For those of you intrigued by the title – it comes from spending many years climbing up, down, and around mountains in Scotland – walking around the side of a mountain is known as “contouring” and gets pretty tiring after a while. Having adjustable legs would have been really helpful. 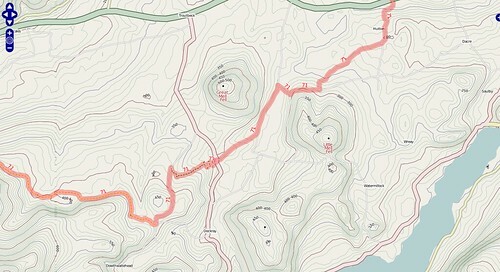 This entry was posted in Uncategorized and tagged OpenStreetMap on February 18, 2008 by Andy. Fantastic step forward! Thanks for your continued hard work on this. One slight gripe, though, for city cyclists. The contours are *very* subtle in areas with a lot of colourful features, e.g. There are actually some annoying hills around there, at least by my lazy standards, but you wouldn’t easily spot them from the map at the moment. Obviously you don’t want to make them too horribly dominant, so maybe an overlay of big fat contours would help? Cool, realy very very very cool!!! Have one question: how to make mountainbike trails? I cannot find it anywhere. Is the data srtm or other ? Tom – it’s a balance. I don’t think the hills in London are all that important or particularly steep 🙂 I had a look to see how other maps handle contours in urban areas, and again for the most part they are hardly visible. But I haven’t seen how any slippy maps deal with contours and very high z14+ zoom levels. Bert – I can’t remember off-hand, Dave did it after a trip we went on in November as a proof-of-concept. I’ll put them on the wiki at some point. Yes, the data is SRTM, so it only covers up to 60N and there’s void issues here and there. really great looking maps, great job! and the roads showing up a little better is an improvement. An unrelated and slight rendering bug with the name of ‘The Plough’ pub here. I found some minor render problems in the Black Wood Forest where the clearings are made with natural=wood. The same is with lakes where it would be nice to see how deep they are. Thanks a lot for your work….!!! Hi Gerco-Kees – that’ll be the coastline shapefile being out of shape. I grab them from http://tile.openstreetmap.nl/coastlines.html whenever I notice a bug like this – but sometimes I have to wait a couple of days if the world has gone blue again! Since Jon is doing the same for mapnik (grabbing them every now and then when they look good) we’re always out-of-sync. I’ll grab some new ones this week. Thanks for pointing it out! Great work! But with an awkward error: The numbers at the contour lines should be readable from low to high (readable from the bottom of valleys). This allows to identify the direction of gradients if you do not have rivers or peaks on the current map clipping. Just thought I should inform you, in case you weren’t already aware. Frank – doing the contour numbers better is on my todo list. Thomas – the 17th layer is only there for a different project. It only covers Central London and I’ve no intention of extending it anywhere else (it’s far too disk-wasting) so I didn’t want to show it on my site at all. Gerco-Kees – the problem is that the contours are mainly interpolation between widely-spaced spot heights, and are therefore somewhat fictional. The more accurate I pretend they are (e.g. 1m contours) the more they are likely to be wrong or misleading! further to MTB comments; i’ve now added “mtb=yes” to the MTB track i’ve done, to see if that gets it showing up next week. another request for the rendering: any chance of getting aerialways with bike=yes to show up? NCR7 is getting there – slowly. thanks to whoever did the kilwinning to johnstone section – i’ve filled in some other blanks in ayrshire. This is fantastic – awesome work!